What a year 2015 has been! There have been so many great moments, but we’d like to share just a few highlights with you now. A number of organizational changes took place this year, perhaps the biggest and most significant being our transformation into a fully registered Local NGO: PEPY Empowering Youth. This transition means that we are now a Cambodian NGO, run by Cambodians, for Cambodians. Not only that, but we now also have a local Board of Directors who are able to provide us with support right here in Cambodia. The PEPY US Board remains very active in their support of PEPY Empowering Youth, for which we are very grateful. We are extremely proud to have made it to this point and would like to thank everyone who has been involved in PEPY and PEPY Empowering Youth over the years – long may it continue! To read more about this transition, please click here. 2015 also saw a big change take place in the PEPY Empowering Youth staff, which was met with both sadness and excitement in equal measure. In September, Kimline Nuch took the decision to step down as Executive Director of the organization in order to pursue her dream of establishing her own accounting consultancy firm. While this was certainly sad news for everyone, it was made much more bearable by the arrival of her replacement, Sarakk Rith. Sarakk has been an important member of the PEPY family for many years and we feel very honored that he decided to return to the organization after spending some time with other NGOs. PEPY Empowering Youth is grateful to both Kimline and Sarakk for their dedication, generosity and passion, and wishes them continued success in their new roles. Not only did Sarakk re-join the team in 2015, but PEPY Empowering Youth gained two more special additions to the team this year. It was with great pride that we welcomed two third year PEPY Scholarship students into full-time employment with the organization: Channa Kev took on the role of Scholarship Officer and Savoeng Skut became our Dream Management Officer in Kralanh. They have shown themselves to be valuable and engaged members of the PEPY Empowering Youth staff and, having gone through the Scholarship process themselves, they are the ideal people to support our current students. They are fantastic role models for other young people in their community, inspiring them to study harder and to change their views towards the value of education. PEPY Empowering Youth is really pleased to have Savoeng and Channa on the team! At PEPY Empowering Youth, we not only encourage new people to join the PEPY family, but we also believe it’s important to continue the development and motivation of our current staff. For this reason, one of our long-time staff members, Konnitha, traveled to Scotland for ten days to take part in the Findhorn Foundation’s School of Youth program. This innovative program combines outdoor activities with music, art and philosophy, the focus being on the development of life skills that are related to ‘peace, sustainability, entrepreneurship and human flourishing’. The adrenaline-filled activities included rock climbing and hiking, complemented by more r elaxing activities like fruit picking and gardening. There were also many opportunities to discuss deeper topics, such as ‘Conflict and Peace’. This trip was Konnitha’s first time traveling alone and so naturally, there were times when she felt homesick. However, Konnitha recognizes that this was exactly the type of character-building challenge which helped make her a stronger, more resilient person in the face of difficulties. Of course, she also met a lot of new friends from all over the world and, as a result, was able to learn and broaden her own horizons and opinions. 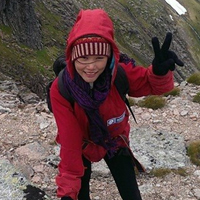 PEPY Empowering Youth congratulates Konnitha on achieving so much during her trip and we would like to thank the Findhorn Foundation’s School of Youth for providing such a fantastic opportunity. To read about the trip in more detail, click here. So what about the students themselves? Well, PEPY Empowering Youth greeted a new promotion of Scholarship students from Kralanh in the fall, who have since been working hard on improving their IT, English and soft skills in the PEPY Learning Center, alongside their various studies at institutions in Siem Reap town. PEPY Empowering Youth has provided support to 50 students already and those who have been with PEPY for a number of years have also been busy with their studies and continued development, and we are extremely proud of all the success they have achieved so far. One example of such success is the graduation of five Scholarship students from the Paul Dubrule School of Tourism and Hospitality – this is a huge credit to their commitment and dedication to their studies. Not only that, but 95% of students from years 1 and 2 who have completed their time at the PEPY Learning Center have now entered full-time employment. This is an incredible achievement for the students, who all come from a rural area where there are very few opportunities for young people, outside of the traditional routes of farming or seeking work in Thailand. To hear more about two students’ –Ravy and Voeut – transitions into the world of work, please click here and here. PEPY Empowering Youth also organized a number of events this year to promote the value of education directly in the Kralanh community and to show students the sort of opportunities they could have, should they decide to continue their education. The first of these events was the Skills Fair, held in March at Kralanh High School. The aim of this event was to create awareness among the students of the opportunities available to them beyond graduating from high school, and also to provide them with the chance to speak directly with skilled professionals, who could give advice and share their personal experiences. The morning was taken up with the skills fair portion, then various workshops took place in the afternoon, such as CV and cover letter writing, job searching and interview tips. The event was well attended and the students really took advantage of the chance to find out more about possible future careers. We would like to thank all the organizations which attended the event and shared their experiences with the students.The second important event took place in July: a study tour of Siem Reap for Kralanh High School students. This tour was organized to introduce the students to the institutions in the city that they could potentially attend i n the future, allowing them to make a more informed choice when selecting what to do after graduation. The tour began with a visit to Paul Debrule School of Tourism and Hospitality, already a popular choice with current and past Scholarship students. Here, they were able to explore the facilities and equipment used in the school, as well as talk to some of the teachers who work there. The students then visited the University of South East Asia, where they received an in-depth presentation about the history of the institution, the courses on offer and student experiences from past students. After lunch at Angkor Wat, the group paid a visit to the PEPY Empowering Youth Learning Center. They were able to explore our facilities and speak with staff about the upcoming scholarship opportunities. The final stop of the day was the Provincial Teacher Training College. Several students aim to train to become teachers after leaving high school, so this visit proved extremely valuable, as they were able to acquire all the information needed to prepare their applications. The study tour was a great success and we hope that the participating students are now in a position to make a more informed choice about their exciting futures! While the students’ education is of course the main priority here at PEPY Empowering Youth, one of our core values is ‘Learning, sharing and having fun’: it was with this in mind that the students also took part in a range of fun, yet valuable, activities over the course of the year. 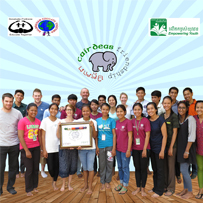 These included participating in the Angkor Wat International Half Marathon and the Angkor Cup Climbing Competition in December, as well as some Irish dancing lessons in the Learning Center, provided by the best possible teachers: volunteers from our partner schools ETNS, Ireland! However, the real highlight for the students came in the form of a week-long trip to Jombok Hoas (literally “flying through the trees) in Preah Vihear province, with one group of students going in July and the other in December of this year. At this amazing adventure retreat, the students were able to build on the skills they had been acquiring at the Learning Center, such as communication, self-confidence and team work. Both trips were deemed a great success by all the students and the PEPY Empowering Youth staff that accompanied them. In addition to these activities that took place in Cambodia, two of our Scholarship students had the opportunity to travel to Hoi An, Vietnam, in June in order to attend the Sustainability Field School. This school is coordinated by Action for the City, and the PEPY representatives were funded by Irish Aid. The idea of the project is to encourage community involvement, especially amongst university students, and prepare them for careers that foster grassroots actions in s ustainable development. The two PEPY students who took part, Sao Ry and Savoeng, joined a group of Vietnamese students to learn about public space, sustainable tourism, environmental education and organic agriculture. Both of the students thoroughly enjoyed the trip, although there were certain aspects which they found challenging, particularly the language (everything was conducted in English). 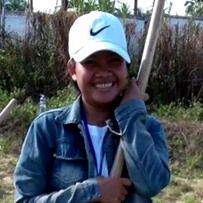 By the end of their time in Hoi An, both Sao Ry and Savoeng had built on the skills they had been learning in the PEPY Learning Center, and also learned some important lessons about themselves and how they react in the face of challenges. They returned to Siem Reap with a better understanding of both sustainable development and of themselves. PEPY Empowering Youth wishes to extend its thanks to Irish Aid for supporting Sao Ry and Savoeng’s involvement in the program, and to congratulate the two students for being great ambassadors for our organization. This year also heralded a major milestone in the development of our educational partnership with Educate Together National Schools in Ireland. First of all, after months of planning and preparation, four members of the PEPY Empowering Youth family (two students and two staff) traveled to Ireland in April for a three week exchange visit. The PEPY representatives stayed with various host families during their visit, which meant they got a real sense of traditional family life in Ireland, and the three weeks were packed with school visits, presentations and trips to famous sights. The final day of the trip was named ‘Cambodia Day’ in honor of the partnership and was celebrated with a 5km fun run, with participants running through all the countries which lie between Siem Reap and Dublin. A detailed account of the trip can be found here. The other side of this fantastic exchange took place in July, when five teachers traveled to visit Cambodia for three weeks. For some of the teachers, this was a return visit to Cambodia, but for two of them, the trip in July was their very first time in the country. The teachers spent a lot of time working with the students in the Learning Center, demonstrating learnin g techniques which are popular in Ireland, as well as teaching the students about Irish culture. It wasn’t only the students who benefited from the exchange – the PEPY Empowering Youth staff also participated in various workshops with their visitors, which focused on a range of education-based topics. The participants all gained some insightful knowledge as a result of the workshops, which they could then build upon after returning to ‘normal life’. This visit and the trip in April were extremely important and proud moments for both sides of the partnership. They reinforced the wonderful collaboration that has emerged over the last two years and everyone involved learned some important lessons about life in the other country. PEPY Empowering Youth is excited to see how this fantastic partnership will develop in 2016. Finally, 2015 began and came to an end with a return to the organization’s roots in cycling. In January, a tired but ecstatic group of cyclists completed the PEPY Ride X, the bike ride across Cambodia that has taken place in December/January every year since 2004. It was a particularly special Ride this time, as PEPY founder Daniela and long-time ex-Managing Director Maryann took to their bikes once again, accompanied by a group of people who all had some personal connection with the organization. It was by no means an easy trip, but after almost 1000km the group had become stronger, both physically and mentally, and felt ready to embrace the New Year with open arms. To close the year, long-time friend and colleague of PEPY Empowering Youth, Cho, decided to embark upon a fundraising bike ride from Phnom Penh to Ho Chi Minh City in Vietnam. He was joined by his friend Joe and together, they covered almost 500km in seven days – an incredible achievement! A more detailed post about this particular trip will be coming soon, so stay tuned. PEPY Empowering Youth would like to thank Cho, Joe and all the PEPY Ride participants for giving their time to raise funds and awareness for the organization this year. We are incredibly grateful for your support. And so, we close the chapter on 2015 with a huge amount of gratitude, pride and joy. PEPY Empowering Youth would like to extend a MASSIVE thank you to everyone who has contributed in any way to our success this year, and a special thanks to the donors who continue to support us, we simply could not achieve so much without you. We would like to extend a huge congratulations to the students and staff who have achieved so much. We wish you all a happy, healthy and successful 2016, and we look forward to bringing you more good news from PEPY Empowering Youth in the New Year!